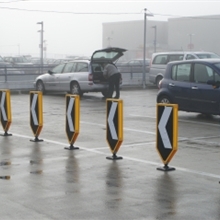 The Flecta range are impact resistant, passively safe bollards which utilise the very latest retro-reflective materials - 3M Diamond Grade DG3 in Yellow Fluorescent for superior daytime and nighttime viewing. 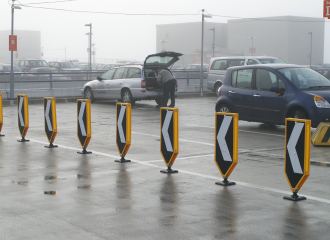 The Flecta bollard is ideal for use in locations where there is a high likelihood of vehicle impact - traffic centre islands, roundabouts, built-outs, car parks and slip roads. 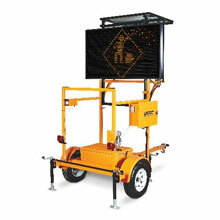 The Flecta range is available as single-sided or double-sided (Flecta Plus) and can be supplied in a range of formats - Keep Left/Keep Right - as well as bespoke designs unique to the required location/road conditions. Quick and east to install, they offer unique value for money due to their ability to survive multiple vehicle impacts. They also continue to warn road users of the hazard ahead after a collision.